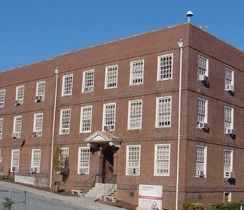 Hirsch and Feebeck Halls, both on Grady Hospital's historic campus, were constructed to support Grady's nurse training operations. Hirsch Hall, designed by Eugene Wachendorff, was built between 1920-22 to be a state of the art nurse training facility including labs, classrooms and a library. Its distinctive features include a classical front portico, sun porches on the east side and a rooftop porch. Feebeck Hall, designed by Hentz, Adler and Schutz, was constructed during World War II to train nurses as part of the war effort. It is much simpler than Hentz, Reid and Schutz usually designed due to its construction during wartime, but is ornamented by beautiful design: Georgian Revival door hoods, fine Flemish bond brickwork and double hung 8 over 12 windows. Hirsh Hall was demolished in Mid-August, 2011. Feebeck Hall was demolished in September, 2011.